The Atoll 11’0″ Foot Inflatable Stand up Paddle Board is built with NEW Ultra Light Construction – 30% lighter than comparable models. Its rigid construction in high-quality PVC with Korean drop-stitching makes it possible to accept a maximum load of 250 lbs that can be split between riders and gear. Plus, it includes extras like heavy-duty D-rings to secure a cooler or even a kayak seat backrest for the more versatile use. Comes with 2nd Generation Aluminum Adjustable 3 Piece Paddle with nylon blade. Detachable extra durable removable fin. ISUP also comes with 2nd Generation Aluminum Adjustable 3 Piece Paddle with nylon blade. Detachable extra durable removable fin. Backpack Carry Bag now doubles as a dry bag (large enough to fit pump, paddle, paddle board, and ISUP repair kit), contains 2 Drings on each side of dry bag making for easy lashing of ISUP to bag or other attaching other objects. 6 inch thick, 32 incess wide and 11 feet long. Tested and quality assured ISUP board, Fully wrapped with second layer of material on the top and bottom: creates a stiff, rigid and sturdy board with 14 D-rings on the deck to tie down anything you need. 2 YEAR MANUFACTURERS WARRANTY – Atoll Board Co’s inflatable boards Are covered from any workmanship or material defect for a period of 2 YEARS. ATOLL BOARDS offers only the highest quality products and stand behind them 100% become part of the fastedt lifestyle sport in the world. If you really want to know what REAL Customers are saying about the Atoll 11’0″ Inflatable Stand Up Paddle Board, take a look at the following pros and cons that have been sourced from reading customer feedback. Very balanced and well built. The newer version is lighter than and just as rigid as the first generation boards. Atoll inflatables are high quality and durable. Very stiff once pumped to 15 psi. One customer had a faulty seam that leaked and had to send it back. So it’s possible that oversite of manufacturing may be slightly underserved. 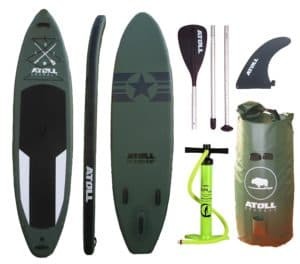 The Atoll 11’0″ Foot Inflatable Stand up Paddle Board has a solid 4.9 out of 5 rating on the Amazon marketplace to provide a reliable performer over flat-water. With its high weight limit (250 lbs), Bravo dual action hand pump, and solid construction, this iSUP is certain to appeal to those paddlers that are just starting out with this fun and engaging watersport. Even though one customer had a problem with manufacturing, the company seemed to respond quickly and made an effort to fix their mistake, customer service appears good.